Under Mayor Bill de Blasio’s leadership, the City is committed to ensuring that New York City is the fairest big city in America – an inclusive economy is a thriving economy. To help the City achieve this goal, the NYC Department of Small Business Services (SBS) offers tailored initiatives to support the small businesses that are vital contributors to our local economy. We’re helping Minority and Women-owned Business Enterprises (M/WBEs) sell to the City because more contracts for qualified M/WBE firms means a more prosperous and equitable city for all. M/WBE certification is the first step in positioning minority and women entrepreneurs to access government contracts and grow their businesses. At SBS, we’re helping certified businesses to become more visible to prospective buyers, including City agencies and private contractors seeking to purchase goods and services. Through one-on-one assistance and training, we help M/WBEs navigate government contracting, and bidding which for many is new and daunting territory. Firms that participate in our mentorship programs receive no-cost business needs assessments and individualized growth plans. We also help M/WBEs access affordable loans to grow their capacity and perform. Because we are committed to the success of M/WBEs, our support is available throughout the entire process. In fact, two-thirds of M/WBEs that have won contracts have received our services. 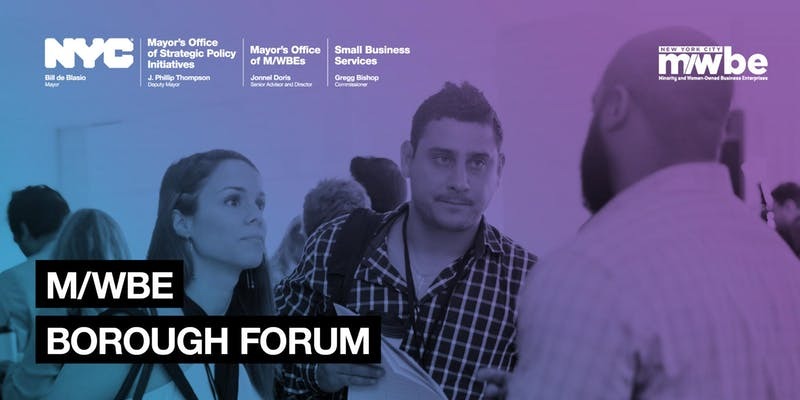 Early last fall, we launched a citywide M/WBE Borough Forum Series to bring opportunities for success directly to M/WBEs’ neighborhoods. The series connects certified M/WBEs to City agencies with active business opportunities. M/WBEs can sign up for mentorship programs and workshops and learn about financing opportunities specifically designed for firms that contract with NYC. Firms not yet certified with the City can get started on the streamlined, online certification process. Since the series launched, we’ve brought together MWBEs and government buyers in Queens, Manhattan, and the Bronx. Our next stop is Brooklyn. On Wednesday, January 23rd, join us at Medgar Evers College in Brooklyn from 10:00AM – 2:00PM. To register for this free event, visit bkforum.eventbrite.com. Translation services will be available in Spanish and Haitian Creole. Register now to attend this free event. Let us help you to position yourself for success.